Located just 300 metres from the INA metro station lies the bustling lanes of INA market. Famous for its fresh fruits and vegetables, the market is the kitchen shopping hotspot for the locals. 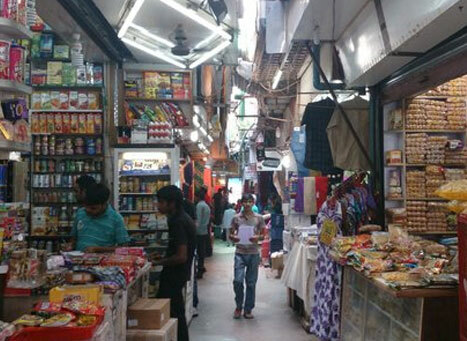 The market is one of the oldest surviving market in Delhi and rightly so, the market offers the best quality products. If you wish to buy meat, INA market is your spot. The fresh and healthy meat available in the INA market has no competition what so ever, in terms of quality. A bit on the expensive side, the prices of the products are compensated by the quality of the products. The INA market is a dream come true for every food lover, Gourmands and aspiring chefs with its extensive range of food products. Whatever ingredient you need, the INA market would provide you with it. The quality of fresh meat is also top notch. Delhi’s most exciting food bazaar, the local shops filled with imported package food makes up for a great kitchen shopping experience. The market is also famous for its unique range of sea foods. The market also boasts of its exotic wine collections with some of the oldest and famous Wines being put on display. Opposite to INA market, also lies the famous INA Dilli Haat. You can shop for home decor items and hand-crafted products. INA metro station on Yellow Line of Delhi Metro is the nearest metro station to INA Market. INA Market is famous for food shopping and wine shopping. INA market is the best market to buy fresh fruits and vegetables and cooking products. You can also buy exquisite wines and dry fruits. The Khan market opens up around 10 am and closes around 8:30 pm. The market remains open on all days except Monday.